This is a short in office procedure to examine the cervix with a microscope after an abnormal pap smear. The purpose of this procedure is to detect abnormal or precancerous cells on the cervix. If the doctor sees any abnormalities he/she may take a biopsy to have the tissue examined further by the pathologist. This is not a treatment for abnormal cells, it is used to diagnose abnormalities and guide treatment options by the physician. This procedure usually has only mild discomfort, if any, and lasts less than 10 minutes. The hysteroscope is the medical term for a small camera that can be placed through a patient' cervix to look inside the uterus. This can be done under local anesthesia in the comfort of our office. This is done in conjunction with the Essure procedure, but may also be done for other reasons. This is a short procedure with minimal discomfort, lasting approximately 15 minutes. This is a short procedure that can be done in the office setting to lighten or stop your menstrual periods. 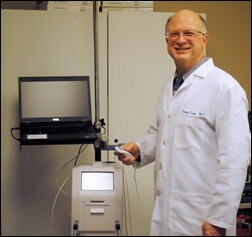 A hysteroscope is used during a portion of the procedure. The Novasure uses radio frequency energy to treat the lining of the uterus, and removes the lining of the uterus in under two minutes. It is a safe effective and pill free way to treat heavy vaginal bleeding. The ablation procedure in total takes approximately 15 minutes. See more information at Novasure®. Also called cystometrogram, this is a study to examine how the bladder and urethra are functioning. This is used in evaluation of urinary incontinence problems. There is minimal discomfort for the patient during this procedure which involves placing a catheter in the bladder and filling it with fluid. This is an important component in the evaluation of patients with incontinence symptoms and takes approximately 20 minutes. 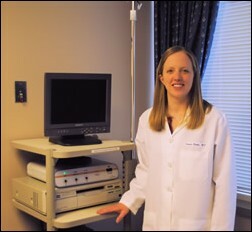 We perform routine gynecologic and obstetrical ultrasounds in our office. Ultrasound is important in pregnancy to help with accurate gestational dating and to screen for anatomic abnormalities in the fetus. 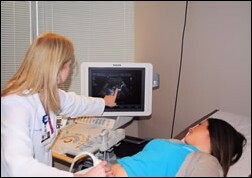 Gynecologic ultrasound can help us in evaluating many problems including abnormal bleeding and pelvic pain. IUDs, intrauterine devices, are commonly used forms of birth control and are also used as a treatment for heavy menstrual bleeding. We routinely place these in our office and encourage you to talk to your physician at your appointment if you might be interested in one. The IUDs we place are Mirena®, Skyla & Kyleena® and ParaGard®. Nexplanon is a long-acting birth control option. It is a small arm implant that provides up to 3 years of birth control coverage. It is placed under the skin of your upper arm in a discrete location with a minor procedure, similar to an IV insertion. It is reversible and can be removed at any time. We routinely place these in our office.